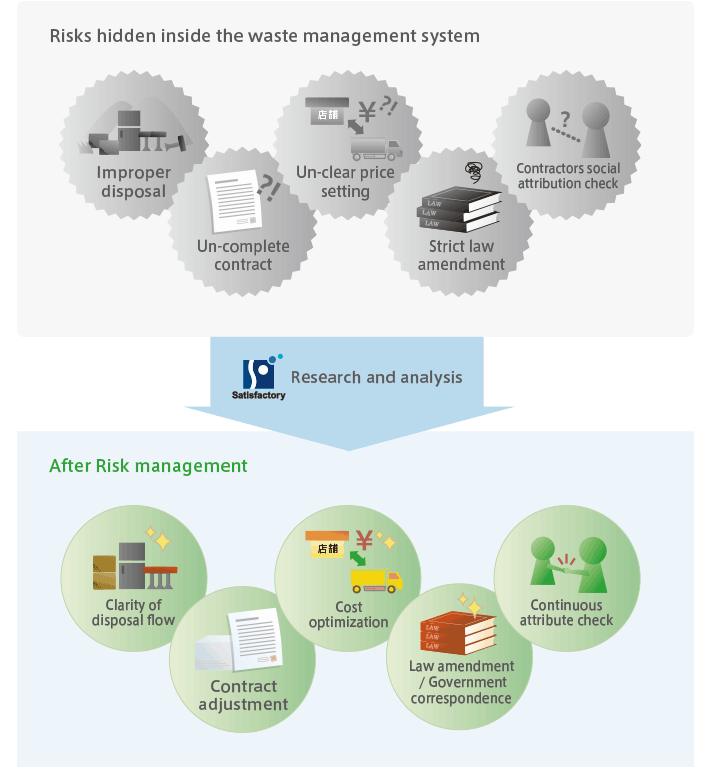 Eliminate the risks of waste management and improve the corporate value. There are many risks, like illegal dumping hidden in waste management. However, because it is an unproductive and non-profitable activity, the waste emission and waste treatment method is often perceived with less interest. On the other hand, due to the escalation of environmental problems, the waste disposal law has been amended leaving more responsibility to the waste emission operator. The lack of compliance management can lead to a minus impact for corporate survival and business continuity. Satisfactory International will provide ‘A clear waste disposal company selection’ ‘Recognition of potential risks’ ‘Clarification of waste disposal process’ to reduce risks and to elevate the corporate value.